The Home Transitions Program is specifically designed to meet the needs of people who have had a recent hospital or skilled nursing home stay and are now returning to home. The program’s goal is to provide an extra layer of support and care for people who are dealing with certain chronic conditions and are at risk for re-hospitalization. If you have recently been in the hospital or a skilled nursing facility, and if you have any of the following health conditions* you could benefit from the Home Transitions Program. *Note: These are only some of the conditions that people may have and benefit from by being in the Home Transitions Program. 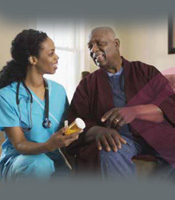 UPMC Home Healthcare Team which may include a Registered Nurse, Physical, Occupational or Speech Therapist, Home Health Aide, Dietician, Wound Care Specialist, and Behavioral Health Nurse depending on your needs. The social worker can help you and your family adjust to episodes of acute and chronic illness. The social worker can assist with a range of needs, including establishing goals of care and access to community resources. A Transition Care Coordinator will work with your home care team, and your doctors to make sure that your care goes according to plan.